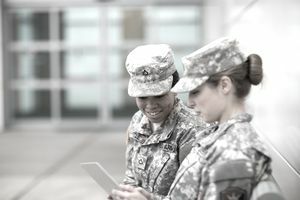 Can I Join the Military With a GED? Joining the military is a competitive process. Not having a high school diploma will be a disadvantage to potential recruits applying to join any branch of service. Having a GED or General Education Development or also known as General Equivalency Diploma is an option if you were unable to graduate from high school, but the route is not easier than the traditional high school diploma. There are additional requirements for GED holders that high school graduates do not need. All of the services strictly limit the number of high school dropouts (which includes GED holders) who can enlist each year. It is because years of military enlistment statistics have shown that this category of enlistees fails to complete the entire first term of military service at about twice the rate of those with a high school diploma or those with college credits. If you have a high school diploma or higher, you are categorized in Tier 1 classification, and if you have a GED without college credits, you are classified as Tier 2. However, if a student with a GED completes 15 college credits, that student is reclassified as Tier 1. The Tier 1 student has to perform in the 30th percentile and above on the ASVAB to be eligible for service. The Tier 2 student has to perform above the 50th percentile to be eligible for service. The Air Force is the most strict on this matter. The Air Force allows less than one percent of annual enlistments to be recruits without a high school diploma. The Marines have the next highest standards. No more than five percent of Marine recruits can be GED-holders. The Army allows no more than ten percent each year, and the Navy limits GED enlistments to no more than five to ten percent each year. There are always many more GED-holders who want to enlist than there are available slots, so — even to be considered — a GED holder must score much higher on the Armed Forces Vocational Aptitude Battery (ASVAB), than a high school diploma recruit. However, if a recruit has 15 or more college credits, he/she is in the exact same enlistment category as a high school diploma holder. Thus having a GED with college credits is not an issue the recruiter has to deal with to help the recruit overcome. Most recruiters will first test the GED holder in the ASVAB and see if he/she qualifies with elevated scores on the ASVAB. If not, the recruiter will recommend getting a semester of college that can be accomplished at local community colleges. In the U.S., each state has its own GED requirements, and it can be difficult to locate on the state's website. Adult Education is sometimes handled by the Department of Education, the Department of Labor, or by the States departments of Public Instruction or Workforce Education. To pass the GED, the GED student must score better than 60 percent of high school seniors across the nation. You have to study for the GED, and it is best to learn how to take the test as it is a series of multiple choice and short-form answers. The test also includes longer answers to questions in a short essay format. There are GED preparatory books, online assistance, and local adult education centers across the country. Then after going through the channels to pass the GED, a student now must continue his/her education at a local community college and enroll in enough classes to earn 15 college credits. What Are Military Criminal History Moral Waivers? Can You Enroll in the U.S. Army with Only a GED Diploma? Why is it so hard to join the military now? Can Military Service Actually Be an Alternative to Jail Time?